Stephanie's Astrapia, Astrapia stephaniae, also known as Princess Stephanie's Astrapia, was discovered by Carl Hunstein in 1884. It was named in honor of Princess Stéphanie of Belgium, the wife of Crown Prince Rudolf of Austria, who was commemorated by the Blue Bird of Paradise. 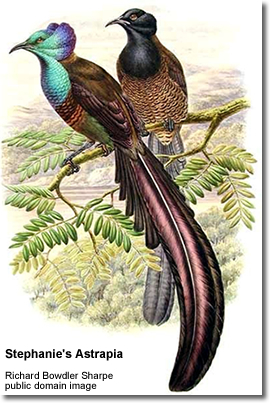 The Stephanie's Astrapia is a medium-sized, approximately 37cm-long, black bird of paradise with an iridescent blue-green and purple head, silky plumage below and two very long, broad purplish-black central tail feathers. The female is a dark brown bird with a bluish-black head and black-barred cinnamon-brown underparts. Hybrids between this species and the Ribbon-tailed Astrapia, in the small area where their ranges overlap, have been named Barnes' Astrapia. It is endemic to the mountain forests in central and eastern Papua New Guinea. A common species throughout its range, Stephanie's Astrapia is listed as Least Concern on the IUCN Red List of Threatened Species. It is listed on Appendix II of CITES.